Editor’s Note: Quite some time ago now I used to post an image or two of what I call “Gravel Mutts”- bicycles that don’t fit into a mold. This was back in the “Gravel Grinder News” site days. Gravel mutts are really interesting rigs. 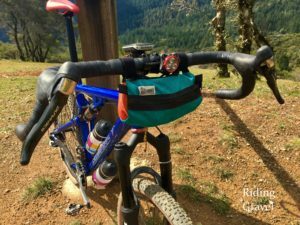 Individualized, modified, and creative, the Gravel Mutt can be quite unique, but more than anything, it is the bicycle that makes riding gravel fun for its owner. Much like a “mutt dog”, these often times are lovable, smart, and one-of-a-kind bicycles that you won’t find in your local bike shop- or anywhere else! 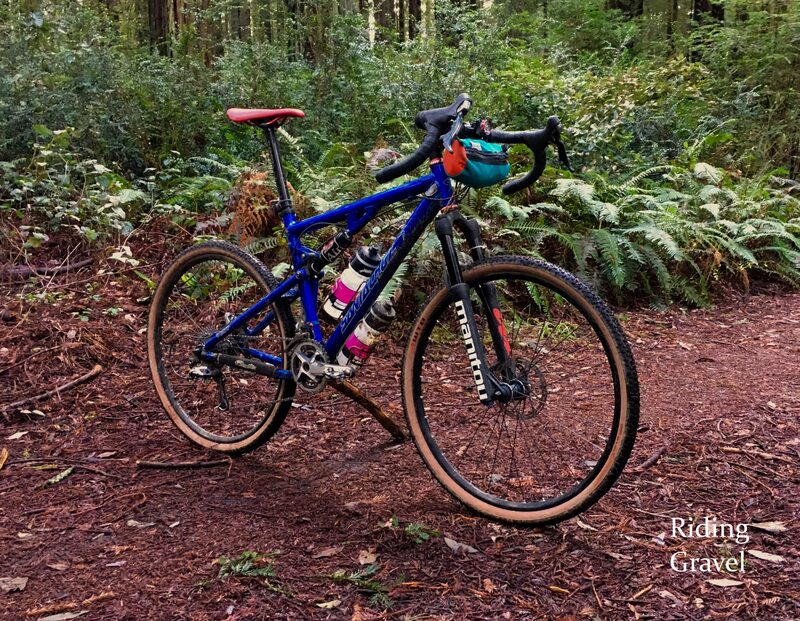 This time we are honored to share with you Eric’s unique take on a full suspension gravel bike. 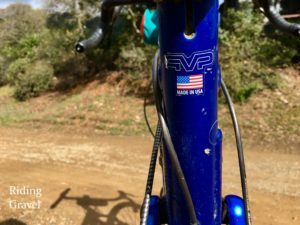 Eric’s “gravel mutt”, a Santa Cruz Blur. 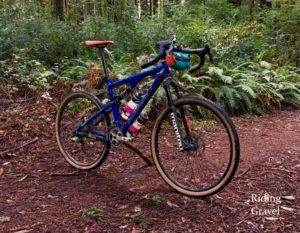 Gravel Mutt: Eric’s Santa Cruz Blur- Words and Images By Eric W. This project began at the D2R2 ride last year, when my beloved Surly Straggler sheared its dropout off due to a jammed chain. The Cannondale crew were kind enough to lend me a Slate to ride for the day, and the additional capability and confidence afforded by its 30mm Lefty Oliver fork was a revelation. I promptly purchased a Slate when I returned home, and it inspired me to think about how a fully suspended “all-gravel” build might feel like, and what new types of riding it might enable. I focused on a few key points while designing this build: efficient full suspension design and CX bike handling were must-haves, which translated to road-ish drop handlebars for the right riding position and 650b wheels/tires to keep rotating weight down. The chassis is obviously the centerpiece and starting place of a build like this. The goal of CX-like handling meant that I needed a frame with a proportionally short effective top tube length and longish seat tube, with a steepish head tube angle. The first generation Santa Cruz Blur 1.0, with its efficient VPP (Virtual Pivot Point) suspension, fit the bill perfectly. My frame is at least one size smaller than normal for me in order to get the effective top tube length close to my road bike fit (56cm ETT). Onto the frame, I assembled a build kit that’s a mishmash of 9 and 10 speed road, mtb, and gravel components, mostly from the spare parts bin or cannibalized from the Straggler: Frame: Santa Cruz Blur 1.0 Medium (18.1” ST, 22.7” ETT, 71 degree HT angle) Shock: Progressive 5th Element Air Fork: Manitou Marvel 100m (for 26” wheels), QR dropout Crankset: Shimano XTR M980 (38/26), threaded 73MM BB Front Derailleur: Shimano Dura-Ace 7900, with a CX pulley Rear Derailleur: Shimano XTR M970 Long Cage Shifters: Shimano Dura-Ace 7900 Brakes: TRP Spyre Brake Rotors: SRAM Centerline with Centerlock adapters, 160mm F/R Rims and spokes: Alex XDLite 27.5” 32h 3-cross on 14g spokes Hubs: Shimano XTR M-970 Tires: WTB Resolute 650x42c (tubeless with Orange Seal) Cassette: Shimano XT M-771 11-36 (10 speed) Seatpost: Thomson Elite Stem: Thomson Elite (100mm, 0 deg) Handlebars: Salsa Cowchipper (46cm c-c at levers, 57cm c-c at bar ends) Headset: Chris King 1⅛” Saddle: SDG Duster Bar Tape: Fizik Endurance with gel pads Cables: Yokozuna Reaction Once I had all the parts together, building the bike went together pretty smoothly over a couple of beers on a rainy Saturday. The main challenge was in figuring out cable runs as the bike was obviously never designed for road bars. I also had to scrounge around in the toolbox for inline barrel adjusters as the road shifter/mtb derailleur setup leaves one with no built in cable adjusters. I was nervous about 650b tires fitting on the 26” frame given the relatively low seat stay bridge, but the 650×42 Resolutes mount up with plenty of room to spare and I think the bike will take everything up to 650×50 tires. Other than breaking the fork in, repacking the suspension pivots, and the usual new bike tweaks, the bike has happily needed just basic maintenance. The ready-to-ride weight came in at a reasonable 25.5 pounds (for comparison, my size L 2018 Slate Force CX1 is 22 pounds ready to ride). Now the elephant in the room: why drop bars? I’d be lying if I said vanity had nothing to do with it. I spent a long time racing road bikes, and while I wasn’t very good at it, I did develop an affinity for a long and low riding position, one which I’ve kept to this day; however, as I got older I realized that my wrists no longer get along with MTB bars, especially wide ones. The flared-out Cowchippers strike a great balance of control off-road and drop bar versatility and – to my eyes – give the bike a nice visual balance. They’re set up a bit higher than my normal road fit, which lets me use the drops frequently and scoot back over the saddle on descents. Handling-wise, this bike feels like a very smooth CX bike, so I met that goal. As for efficiency, Santa Cruz’s VPP suspension lets me run the minimum recommended compression damping and 15-20% sag on the rear shock with no noticeable pedal bob, but good bump absorption. Overall, I’m quite happy with how this project turned out and have no plans of modifying this build in any major way besides replacing/upgrading components as they wear out. 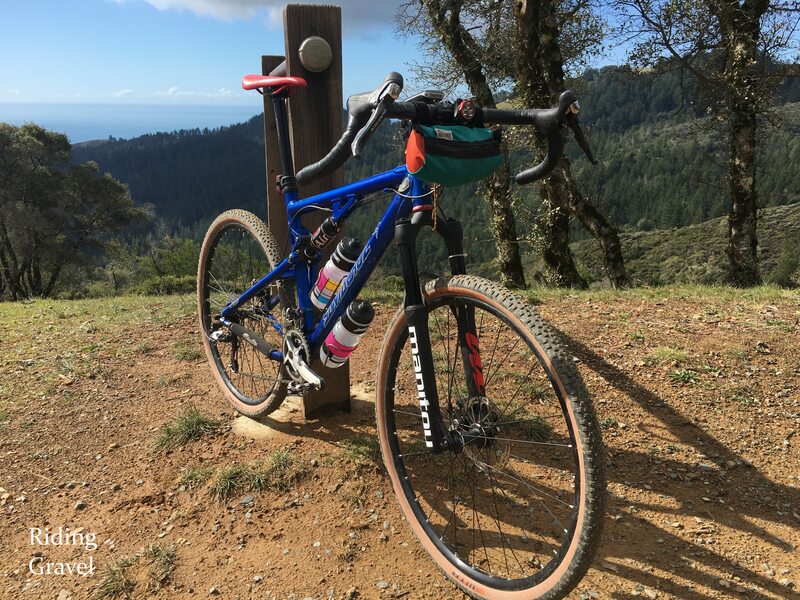 A little about the riding I do: I call the Bay Area home and my favorite local gravel rides all include some terrain that can get a bit hairy on a traditional gravel bike. 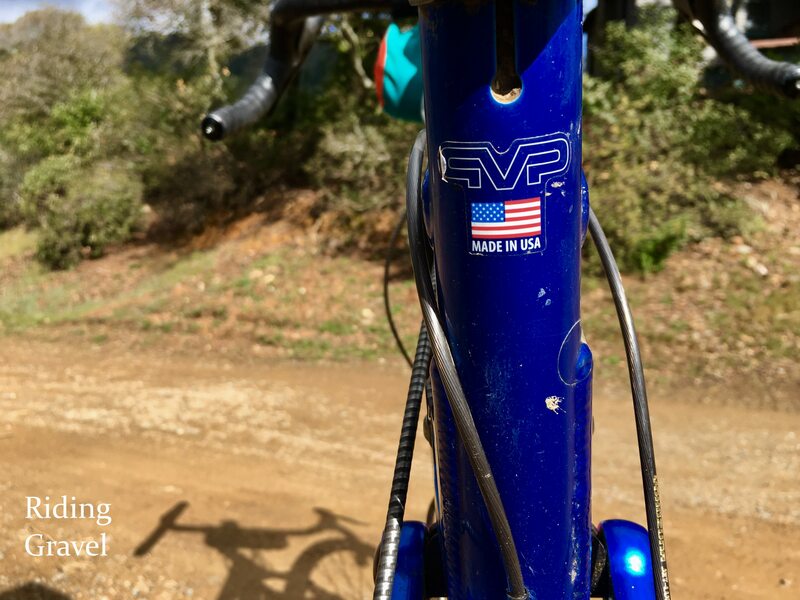 On a typical ride, it’s not uncommon to encounter sustained 15-20% ramps, switchbacks and singletrack with deep ruts, loose rocks, and exposed roots interspersed with long stretches of smoother trail and pavement. I split my gravel riding on these routes equally between the Slate and the Blur. The Blur excels on descents and technical terrain while the Slate has a slight edge on smoother gravel and pavement. Uphill, the rear suspension and low gearing allows the Blur to happily winch itself up steep technical terrain that challenge gravel bikes like the Slate (and even many hard tail mountain bikes). Hard out-of-the-saddle sprints on pavement are not the Blur’s forte, but on smooth terrain it will happily imitate a standard gravel bike without complaint and with no discernible difference in efficiency. Eric rides this Santa Cruz on a variety of terrain and surface types. In many ways, the Blur represents a return to my cycling roots. I started out in marathon mountain bike racing before spending years as a die-hard roadie, racing for town limit signs on Tuesday night club rides and beer money in weekend crits. An old CX bike purchased for a song reminded me of the allure of dirt beneath the tires on car-free trails and dirt roads. These days, I no longer ride competitively – gravel races, the odd road century, and my local riding buddies notwithstanding. While I still spend plenty of time on my road bikes, more often than not I grab one of the knobby tired monsters and head for my favorite trails. While I’m lucky enough to live and ride in a cycling mecca, I definitely plan on trying out some of the big gravel races in the next few years. For this bike specifically, I’d like to give the Crusher in the Tushar a try. The organizers claim it’s a race that regardless of what bike you bring, at some point, you’ll be very wrong. I figure I’ll either be more right than everyone else, or I’ll be way more wrong across the board. Either way, it’ll be fun! Closer to home, in addition to local gravel races, I’d like to do some multi-day adventures on this bike with an overnight saddle bag and handlebar bag this coming year. Finally, for anyone who’s interested in building a full suspension all-gravel rig of their own, I can’t encourage you enough. It’s a fair bit of work, and you’ll probably have to convince some parts that were never meant to work together to coexist. For my goals, the Santa Cruz Blur 1.0 is a great foundation; however, excellent alternatives abound, including the Giant NRS, Titus Racer-X, Orbea Oiz UFO, and older Rocky Mountain Elements and Santa Cruz Superlights. All of these older 26” disc brake equipped bikes can be found for reasonable prices, making a project like this more affordable than one might initially think. No matter what direction your all-gravel build takes, at the end of the journey, you’ll own an incredibly unique, rewarding and capable bike of your own design that will be ready to tackle on any adventure you can think of. We’d like to thank Eric W. for sharing his build of the Santa Cruz Blur with us. If you have a “Gravel Mutt” that you think would make a great feature here on Riding Gravel, send me an email at guitarted@ridinggravel.com and maybe you can see your bike featured on the site. 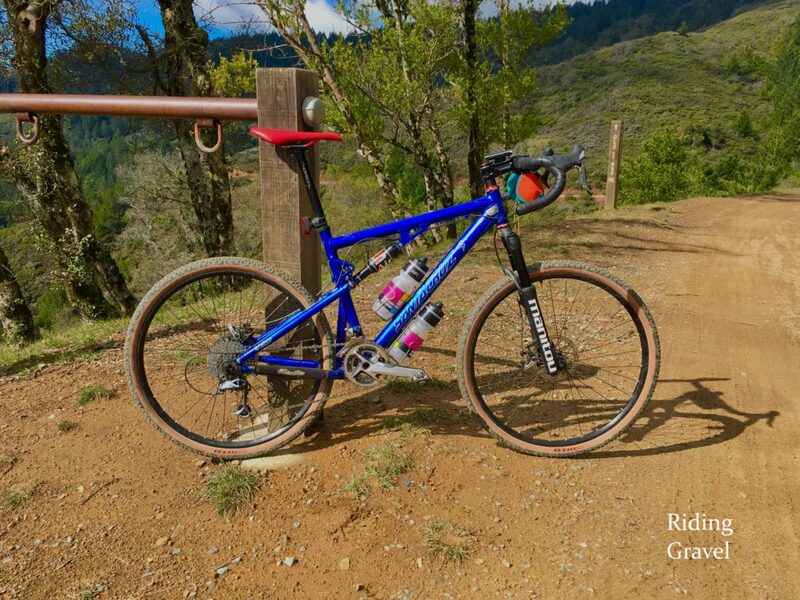 Gravel Grinder News: Rocky Mountain Debuts Gravel Bike, Donnelly 650B MSO’s And More! Huge thanks to Guitar Ted for the opportunity to share my lovable scruffy mutt with the gravel community! Nice! Now I can explain to my wife why I need to keep my old Superlight around! Thanks! This is a great use of that older 26″ bike whose geometry makes it outdated but we’re too attached to get rid of. Also…are you THE Chris King? If so…#fanboymoment. I did the same thing with a Specialized Epic by using light 29×1.8in(700x45mm) tires. However, I didn’t care for it. The suspension sucked up my pedaling energy on pavement and gravel. The narrow, lightly tread tires didn’t hook up well on singletrack. Also, the suspension added unnecessary weight that I didn’t feel that I got much benefit from. Honestly, I think very light weight 2.3-2.4in tires would have performed better. Overall, I think a full rigid bike with very wide, low pressure tires is best for gravel. I had a Titus Racer X, which has a Horst link (FSR) suspension and found it uninspiring unless I used a lot of compression damping. That was the main reasons didn’t choose a Horst link bike as the base for the build. VPP really livestream up to the hype here. This looks like a fun project. Looking at the Orbea Oiz UFO frame, that would make a weird looking gravel rig. I don’t know anything about how good the frame rides though. Anyone have any experience with those? My worry about the Oiz UFO is that the flex tail design with the short linkage behind the seatpost binder has very little anti-squat. Cannondale did that with the Scalpel for a while and I remembered that bike needing a LOT of compression platform to not bob, which sort of defeats the purpose of the suspension. That’s why I ended up going with a chain growth controlled suspension, which is to me a known quantity. Of course, subtle changes in geometry and linkage ratios can have a bit effect on suspension characteristics, so take that with a grain of salt. So I see the Giant NRS suggested – which seems like an ideal candidate due to the suspension design Can anyone here confirm that a 40-42mm-ish 650B will fit out back? From the pictures I can see, clearance to the seatstay bridge looks pretty snug with the stock 26er tires. Asking because an almost mint NRS just popped up for sale 20 minutes away from me. A 26×2.2 tire has an outside diameter of 670.76mm, while the 650bx44mm tire has an outside diameter of 672.00. Almost certainly a 650bx42 will fit if the bike can clear a 26×2.2 tire.